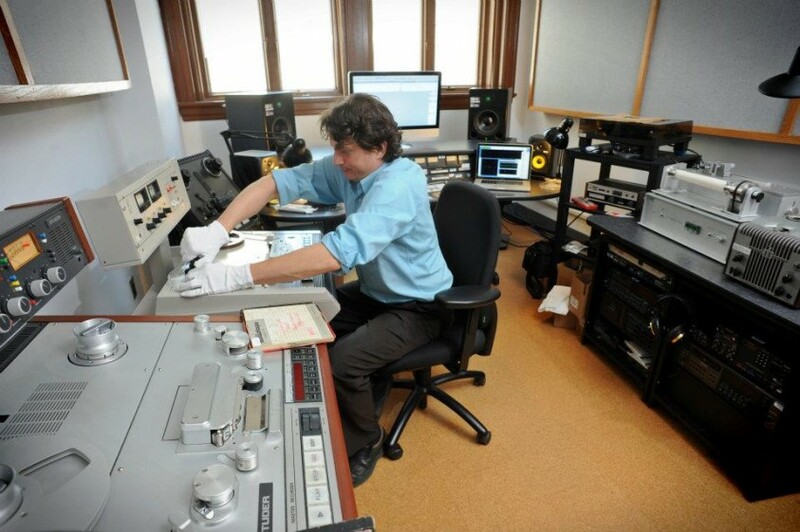 Audio engineer John Loy in the Southern Folklife Collection's John M. Rivers audio preservation studio. Image courtesy of the Southern Folklife Collection at the University of North Carolina, Chapel Hill. With more than 250,000 audio and 3,000 video recordings, as well as books, letters, manuscripts, photographs, posters, and song folios, the Southern Folklife Collection is among the world’s most comprehensive resources for the study of the American South. With a mission to preserve and make publicly available the South’s art and culture, the collection has a special focus on music. Thousands of its country-western, hillbilly, bluegrass, blues, gospel, Cajun, zydeco, and rock and roll recordings are freely available for streaming online, as are many of its films, which document Southern lives and traditions. Recognizing the inestimable value of these materials—as well as the special difficulties inherent in maintaining audio and visual materials, which tend to degrade over time—the NEH has provided significant funding to preserve and digitize this collection and make it available online. The funding has paid dividends in terms of the collection’s use: at the University of North Carolina, students run a public radio show, exclusively using the digitized collection. And in January 2017, the Southern Folklife Collection announced a partnership with Yep Roc Records, a Hillsborough, North Carolina-based company. Together, they are turning select, digitally-remastered archival holdings into vinyl records and CDs that are available for purchase.